Oxford United chairman Ian Lenagan has revealed the League Two club lost £750,000 last year and are expected to lose a further £660,000 in 2013. The U's owner also insists there are no plans to leave their current ground - or abandon attempts to buy it. However, Lenagan revealed he is setting up an advisory panel to identify all the options available. "It's been an awful shock to the system, the amounts of money being lost," he told BBC Radio Oxford. "For three years it was moving forward and got to the point of being better than break even, and I think it can get back to that. "We were aware that loss was going to occur to an extent. But having got through it and paid off those losses and cleared the debts we are in much calmer, cleaner scene going forward and we are moving in the right way. I'm confident I think we can sort it." He said that falling attendances of around 2,000 people, to leave a season's average of 5,977, have cost the club £200,000. But the Wigan-born Oxford chairman was bullish about fans returning. "That's the reality of attendances," he said. "It's not an easy time for fans, there are a lot of games but I'm confident if we get a winning team we will do well." 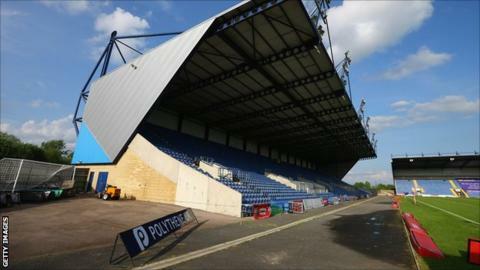 The U's owner also revealed he has set up an advisory committee to explore the possibility of playing away from the Kassam Stadium. The stadium is currently owned by Firoz Kassam and shared with London Welsh. "It is always wise to consider all the alternatives - how realistic it is to get another alternative is another matter," he announced. "We have every right to look at the options that include buying or anything else. "I'm not saying we are going out to find a new stadium. But we are putting an advisory group together who will confirm back to us what the sensible options are for Oxford United, and I'm pleased with idea of doing that. "It's far too early to say we are looking for alternatives - let's get proper advice and seek what options there are for Oxford United." Meanwhile, Lenagan has defended the signing of keeper Luke McCormick, who was jailed in 2008 for for killing two children in a car crash. He believes everyone deserves a second chance, and revealed it "took hours and hours of conversation before making the decision". Lenagan added: "I'm proud of the moral stance that we have taken and that people deserve a second chance. "I think what we did with Adam Chapman was right and the same applied to Luke McCormick, and I think we will be praised for the moral stand we have taken. People have the right to be disgusted, annoyed or irritated." The U's owner says the club also plan to sign a creative midfielder to cover for Peter Leven, who is out for the rest of the season with a knee injury.